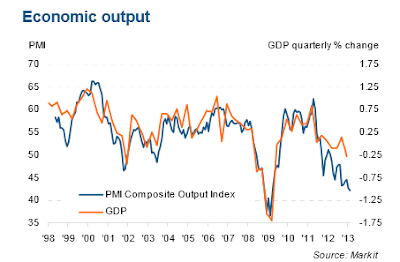 The twin pillars of strength in Europe, France & Germany, both experienced a decline in GDP during the fourth quarter. The story gets more disturbing when you take a closer look at what is taking place in France. Every day the bond market in France remains surprisingly calm with 10 year yields falling in 2012 from over 3% down to 2%. They have recently risen up to only 2.3% as of this writing. Many in the markets view this as more of a gift than a true reflection of fundamentals. Up until this point France has been considered part of the "core" within Europe alongside Germany. They have been the twin pillars that stand behind every bailout and promise of future growth. 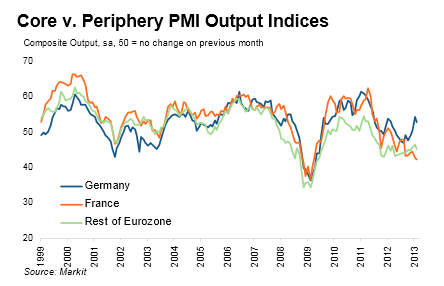 The problem is that France has recently begun to diverge significantly from Germany in terms of economic strength. The following chart shows the recent gap in PMI manufacturing data for Germany (blue line) and everyone else within Europe which now includes France (orange line). 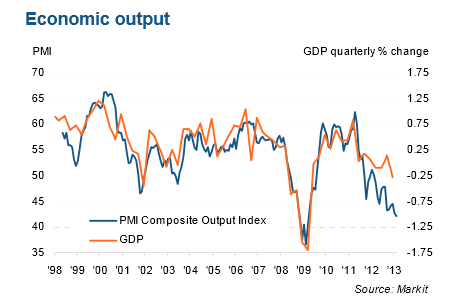 The next chart shows the rapidly declining PMI composite in France (blue) alongside their GDP (orange) which continues to track down and follow it lower. This contraction and divergence has been in part due to sharp increases in tax rates combined with austerity cuts coming from the leadership within their borders. The next chart from Sober Look shows that the only country within the Eurozone that is actually expected to make a cut to their government spending this year is France. During the first chapter of this sovereign debt crisis, it has been austerity that has been punished by the bond markets (when we reach the final chapter it will be the opposite). We'll see if the same soon comes for France, and their 10 year treasury yield is one to keep a very close eye on during 2013. Italy and Spain are far too big to fail. France is much bigger.